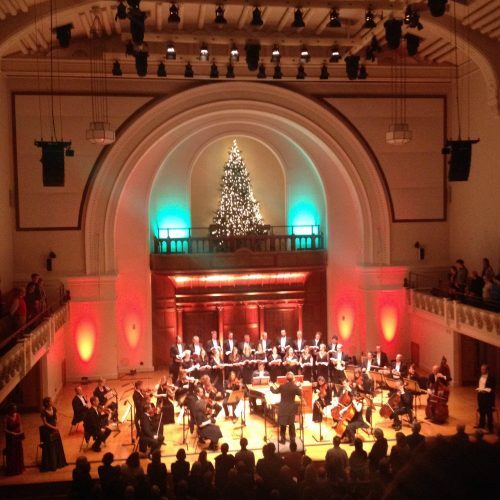 On advent Sunday we returned to Cadogan Hall together with the English Chamber Orchestra for a performance of Handel’s Messiah. We were thrilled to be joined by soloists Grace Davidson (soprano), Andrew Staples (tenor), David Soar (bass) and as a last minute replacement for our Patron Sarah Connolly, who was sadly taken ill, Anna Stéphany (mezzo soprano). Grace, Andrew and Anna all used to sing in Tenebrae as youngsters so it was a particular joy to see how far they had all come since those early days. Of course they sang beautifully and fully entered into the spirit of trying to bring out every bit of drama in the work and I must confess to being blown away by Andrew’s recit sequence ‘Thy rebuke’ and later on his aria ‘Thou shalt dash them’. He, along with the others, are now not surprisingly recognised on the international concert platform as exceptional musicians with wonderful voices and most importantly as having that rare ability to transport audiences in the way they communicate the music they sing. We hope to be performing the Messiah every year on Advent Sunday so watch this space for an announcement on next year – when we hope that Sarah Connolly will be fit and well and able to join us! The choir were stunning and delivered every note with such conviction and power that it was no surprise the audience erupted into cheers (even half a standing ovation, which doesn’t happen often in the UK!) when it was time for them to take their bow. We then launched into several smaller scale events which enabled us to get to grips again – we hadn’t sung it since recording it last year in January! – with the programme for our Christmas concert at Kings Place on December 11th. This was such fun. Along with music from some well-known names such as Peter Warlock, Gustav Holst and John Gardner, there were lesser known gems from major figures in the British choral scene over the last 50 or 60 years or so. ‘I Saw Three Ships’ and ‘There Is No Rose’ by Simon Preston, both infused with some delightful, dare I say slightly outrageous, harmonies and playful syncopations. Add to that Christopher Robinson’s ‘Rejoice and be Merry’, Richard Knight’s ‘Come rock his cradle’, Richard Lloyd’s ‘Love came down at Christmas’, Adrian Peacock’s firecracker ‘Veni, veni’ and many others it all made for a lovely evening of fresh repertoire for this time of the year! Again a good portion of the audience jumped to its feet at the end and gave the composers who were present a huge ovation as true servants of our wonderful heritage in choral music. Long may it continue. I wish these composers and the other contemporary composers I’ve had the good fortune to work with, all of our glorious and talented singers, our fabulous new manager Henry Southern, our brilliant and generous Trustees and Patrons, and indeed all of our audiences and anyone who has enjoyed listening to music performed by Tenebrae a very merry Christmas and a happy new year!